This article is about the men's team. For the women's team, see Burkina Faso women's national football team. The Burkina Faso national football team, is the national team of Burkina Faso and is controlled by the Burkinabé Football Federation. They were known as the Upper Volta national football team until 1984, when Upper Volta became Burkina Faso. They finished fourth in the 1998 Africa Cup of Nations, when they hosted the tournament. Their best ever finish in the tournament was the 2013 edition, reaching the final. The country made their first appearance in the Africa Cup of Nations in 1978, but it was 1996 before they returned to the biennial tournament. They subsequently qualified for five consecutive tournaments between 1996 and 2004, reaching the semi-finals under coach Philippe Troussier when the tournament was held on home soil in 1998. Burkina Faso played in Group B of the 2010 Africa Cup of Nations alongside Ghana and Ivory Coast in a three-team group due to Togo's withdrawal. Although they drew their first match against Ivory Coast and needed just a draw against Ghana to progress, the Burkinabe lost 1–0 and failed to qualify for the knock-out stage of the tournament. Burkina Faso took part in the 2012 Africa Cup of Nations, losing all three of their matches and subsequently firing coach Paulo Duarte. Belgian coach Paul Put was announced as new coach in March 2012. Burkina Faso finished first of their group, but lost to Nigeria in the final of 2013 Africa Cup of Nations. The team is nicknamed Les Etalons, which means "The Stallions". It is in reference to the legendary horse of Princess Yennenga. The following players have been selected for the 2019 Africa Cup of Nations qualifier match against Mauritania on 22 March 2019. Caps and goals updated as of 22 March 2019 after the game against Mauritania. The following players have been called up for Burkina Faso in the last 12 months. 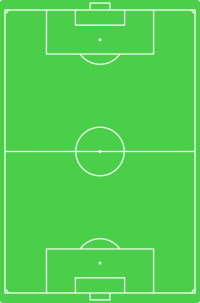 Players in bold text are still active with Burkina Faso. ^ Mamrud, Roberto; Stokkermans, Karel. "Players with 100+ Caps and 30+ International Goals". RSSSF. Archived from the original on 2011-06-28. Retrieved 2011-03-27. ^ "Burkina Faso fancy their chances". BBC Sport. 16 January 2004. Retrieved 17 January 2013. ^ "Burkina Faso 0–1 Ghana". BBC Sport. 19 January 2010. Retrieved 17 January 2013. ^ "Burkina Faso coach gets the boot". BBC Sport. 17 February 2012. Retrieved 17 January 2013. ^ "Former Gambia coach Put handed reins at Burkina Faso". BBC Sport. 24 March 2012. Retrieved 17 January 2013. ^ "Mba's wondergoal wins African Cup of Nations for Nigeria". Eurosport. 10 February 2013. Retrieved 12 February 2013. ^ Marchais, Julien (2006). Burkina Faso (in French). Petit Futé. p. 102. ISBN 2-7469-1601-0. ^ a b Roberto Mamrud. "Burkina Faso – Record International Players". RSSSF. Retrieved 4 January 2018. Wikimedia Commons has media related to Burkina Faso national football team.